The LifeSpan TR1200i folding treadmill is durable, reliable, and loaded with valuable features, helping you walk, jog, or run with confidence in the comfort of your own home. The treadmill’s pleasing design includes safe and convenient handlebar controls, which let you control your speed and incline without ever removing your hands from the handlebars. As a result, you can run or walk without fear of losing your concentration or balance while adjusting your pace. The TR1200i is also built for comfort and power, with a 2.5-horsepower motor, 2.5-inch front rollers, a spacious 20-by-56-inch running surface, and a biomechanically sound deck suspension system that supports people up to 300 pounds. And to help you track your workout progress, the treadmill automatically saves your exercise data to your USB storage device. Once the info is saved, you can upload it to your personal online LifeSpan Fitness Club account, giving you access to exercise programs and detailed reports of your exercise and health results. The centerpiece of the TR1200i, however, is the multicolored LCD console, which offers several simultaneous readouts and exercise programs to help you achieve your health and fitness goals. The display tracks your time, calories, distance, steps, heart rate, speed, and incline level, with large soft-touch keys helping you get started and control your momentum. More importantly, the console offers 17 preset workout programs that help you vary your exercise routine–a critical factor for people trying to get in shape. The TR1200i’s workout programs, which are designed by exercise physiologists to keep you safe and motivated, are grouped by exercise motivation, so you can quickly choose a workout that’s right for you. All programs include 20 different segments, each with its own speed and inline level set according to the purpose of the program. In addition to the preset programs, the treadmill offers two My Zone heart rate control programs and two custom programs. The My Zone Constant program keeps your heart rate at a constant level–thereby using your heart rate as a fitness tool–while the My Zone Interval program lets you enter your own minimum and maximum hear rate. As you exercise, the treadmill speed and incline will automatically adjust to keep your heart rate at the preferred level. By contrast, the custom programs are fully adaptable to your favored workout formula. That’s because you’re in charge of setting the speed and incline level for each of the 20 program segments, and then saving them for future use. As a bonus, when you purchase a LifeSpan TR1200i treadmill, you automatically receive a membership to the LifeSpan Fitness Club. This comprehensive online health management program, powered by the Interactive Health Partner, lets you select exercise programs, track and manage your fitness and health results, and receive motivating support as you work toward achieving your goals. 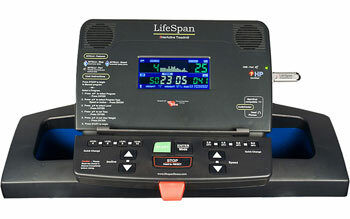 The LifeSpan Fitness Club is easy to use: each time you work out on the TR1200i, the treadmill automatically saves your exercise results on your LifeSpan USB storage device. Because the USB device is personalized with your age, gender, and weight, not only do you bypass setup screens, you also receive accurate calorie calculations based on your data. Every 20 seconds during your workout, the console will then record your heart rate, minutes, miles, steps, and calories. After your workout, you simply upload your results to your personalized online account on your computer using the USB device. You’ll then have access to a full set of detailed reports and fun facts that you can analyze or share with friends, family, fitness coaches, or physicians. Founded in 1994 in Park City, Utah, PCE Health and Fitness has established a reputation for innovation, quality, and community responsibility. 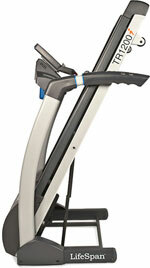 In 2001, the company introduced the LifeSpan line of fitness equipment targeting the over-55, value-conscious consumer. The award-winning line of exercise equipment is now sold by fitness retailers across the U.S, and has grown to include both a high-value home series and a pro series that targets the high-end home user and the institutional customer. This product can only be shipped inside the US. 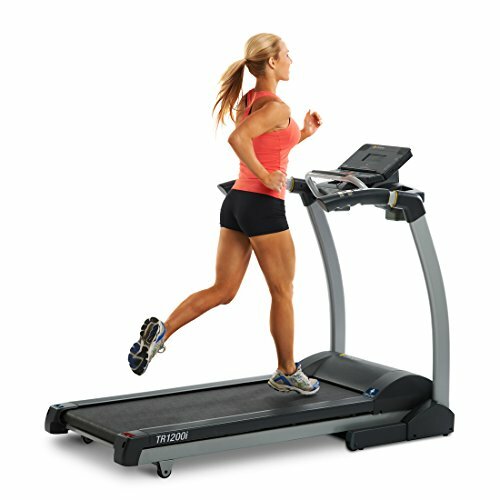 The company’s awards include a Gold Medal Excellence Award from the Industrial Design Society of America, the Treadmill Doctor Best New Treadmill of the Year, and multiple Best Buy and Recommend Buy awards from the Consumer Guide and many others.